Over the last two weeks, I have been collecting research on the Early Christian architecture of Cyprus. These are my first impressions. Five quick impressions of the Early Christian basilicas of Cyprus in tacit comparison to those of Greece. 1. The churches of Cyprus demonstrate a remarkable diversity in decoration, architecture, and organization. Some of this can be attributed to the multiple influences present on the island. The raised stylobates, western narthex and atrium evoke churches from the Aegean, the widespread use of opus sectile seems to be a distinctly Cypriot element as does the creative and unique use of molded gypsum plaster, and the mosaic floors show the influence not only of the southern coast of Asia Minor, but also from the vicinity of Antioch and Beirut in the Levant as well as points further west including the Aegean. From a diachronic perspective, these multiple influences have framed some of the main questions regarding Cypriot culture throughout antiquity and prehistory. Where do the constituent elements in Cypriot culture – including architecture, decoration, and liturgical organization – derive? The diversity of influences reflect in part the wide range of economic contacts between the island and the various regional centers nearby and the degree and nature of external has continued to inform the reading of the design and decoration of Early Christian basilicas in Cyprus (Most famously outlined by A.H.S. Megaw in his "Byzantine Architecture and Decoration in Cyprus: Metropolitan or Provincial?" DOP 28 (1974), 57-88). It is worth noting, however, that the different styles of buildings, sometimes in the same community, also reflect the strategies employed by local populations to mark out their identity. External influence is not simply the passive side effect of economic or political contact between areas that make certain cultural traits inevitable in a particular context, but rather evidence for cultural interact reflects the deliberate and conscious modes of expression in a particular community. 2. Megaw early attention to post-classical monuments and levels has been continued in the impressive record well published churches from Cyprus. Whereas in Greece only a handful of Early Christian basilicas have received dedicated monographs (Demetrias, Aliki on Thassos, for example). 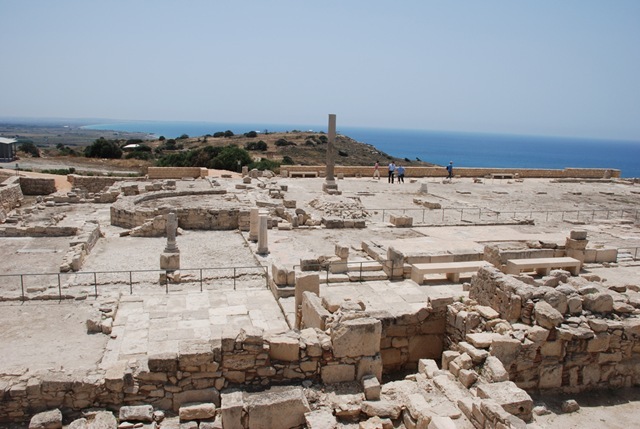 In Cyprus at least six buildings have complete monographs: Soloi, Kampanopetra, the three churches at Kopetra, the basilica at Maroni-Petrera, the church at Alassa, and the very recently published (and long awaited) Kourion: Excavations in the Episcopal Precinct. These churches provide well-documented, if not necessarily well-dated base points, for assessing the lesser known buildings. a. Most churches show several phase of construction. When the phases are close chronologically they often reflect large scale repairs and refitting typically owing either to earthquake damage to the original structure or the desire to build a more expansive and elaborate building. Two phases of decoration, at very least, are visible at Ay. Kyriaki in Paphos, the basilica at Soloi, and the Kampanopetra and Ay. Epiphanios at Salamis. b. In other instances, much later buildings stand atop earlier foundations. The more convenient examples of this come from the three barrel vaulted basilicas documented by Megaw in his 1946 JHS (A.H.S. Megaw, "Three Vaulted Basilicas in Cyprus," JHS 66 (1946), 46-56). There are many other instances, however, including the several examples in which the decoration of the early church continues to be visible in the later building. Three such buildings preserved examples of earlier, pre-iconoclastic mosaic work in apses incorporated from earlier buildings: Angeloktiste at Kiti, Panayia Kanakaria – Lythrankomi, and Panayia tis Kyras – Livadia. c. Finally, the practice of reutilizing Early Christian spolia occurred in Cyprus. The later basilica of Ay. Lazaros in Larnaka includes numerous examples of Early Christian architectural sculpture in its walls. The most interesting example, however, might come from the Episkopi Sarayia which incorporated large amounts of material from the Episcopal Basilica at Kourion into its fabric and decoration. Megaw has argued that this occurred when the Episcopal see was transferred from Kourion to Episopi at some point after the Episcopal Precinct at Kourion was abandoned. (See: A.H.S. 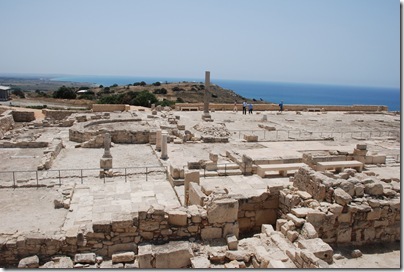 Megaw, "The episcopal precinct at Kourion and the evidence for re-location," in A. Bryer and G.S. Georgallides eds. Sweet Land of Cyprus (Nicosia 1993)). 4. Churches in bunches. Thoroughly excavated sites show evidence for multiple churches. The sites of Kopetra, Pyla-Koutsopetria, and Ay. Georgios Peyeias are examples of relatively small (i.e. non polis sized) sites with multiple churches. 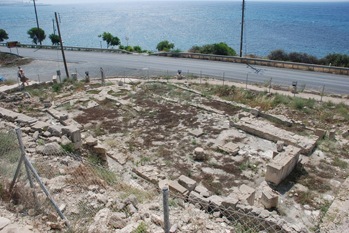 Large sites like Salamis-Constantina, Kourion, or Paphos have produced multiple large basilicas. This is not necessarily a feature distinct to Cyprus. Indeed, multiple basilicas are common even around smaller communities in Greece and elsewhere. How this phenomenon is to be understood is the more pressing matter. Functional differentiation is one potential explanation for the large number of churches. Even modest settlements might have a designated “cemetery” basilica and perhaps a nearby monastic establishment. Church building was an important aspect of the “sacred economy”. The temporal personal prestige as well as genuine piety associated with building a church might also account some of the large number of churches. Finally, it seems likely that the Christian community had a diversity is that is often overlooked by archaeologists. Various heretical groups – from the relatively harmless rigorist sects like Novatianism to more aggressive Monophysites congregations – would have likely fed the proliferation of ecclesiastical architecture throughout the east. 5. The Long Late Antiquity. While there is very little evidence for significant Early Christian architecture in Cyprus prior to the end of the fourth century, the Early Christian basilicas on the island continue to be built well into the 7th century. This is about a century later than the dates regularly attributed to Early Christian basilicas in Greece, but in keeping with the later dates for sites in elsewhere in the Eastern Mediterranean. It suggests that despite the disruptions of the Persian Wars and perhaps even the early days of the Arab invasion, sufficient wealth continued to be available to build relatively elaborate buildings. The ceramic evidence seems to show that Cyprus drew at least some its wealth from its deep engagement in Eastern Mediterranean networks of exchange. Thus, the continued prosperity manifest in the commitment to monumental construction suggests (although it does not prove in a proper sense) that the exchange networks continued to function and generate wealth for the inhabitants of the island. In 1966 A. Papageorghiou noted that around 60 Early Christian basilicas were known in Cyprus (A. Papageorghiou, "H Παλαιοχριστιανικη και Βυζαντινη αρχαιολογία και Τέχνη εν Κύπρωι κατα το 1967-68," ΑΒ (1970)) and by 1985 that number had exceeded 80 (A. Papageorghiou, "L'architecture paleochretienne de Chypre," CCARB 32 (1985), 299-324). I include a list here of around 60 major Early Christian basilicas (and a few minor one). The list in not exhaustive, but a start.